This is a groundbreaking book, written by three music supervisors with broad experience across the field. 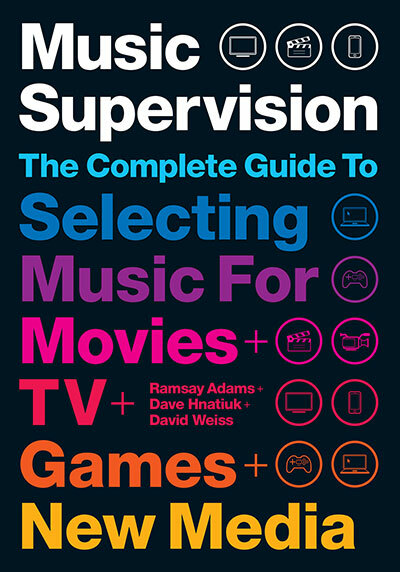 The newly revised, definitive book on music supervision guides you through real-world synch licensing scenarios and legal landmines, explores sound design, and profiles key players. Music supervision, or matching music to all the different mediums from films to streaming content, is one of the fastest-growing careers in the music industry, but finding the winning song for a national ad campaign or compiling a platinum movie soundtrack takes more than just good taste. Music supervision today requires serious multi-tasking and the ability to navigate licensing, relationships, and cultural trends with ease. This book guides you through real synch licensing scenarios and legal landmines you might encounter; it explores sound design and profiles key players with insightful interviews, while providing project form templates that will save time for seasoned music supervisors. Ramsay Adams has extensive experience in branding the look and sound of television, print and new media, from TV shows, film, web design and advertising. At Fox News Channel he was a graphic designer, 3D animator, eventually taking the role of Music Director for all programming. Prior to his television experience, Adams worked as a music manager with an A-list clientele that included Richie Sambora and The Trans-Siberian Orchestra. He has worked with James Taylor and Leonardo DiCaprio on environmental campaigns and helped DiCaprio on the Millennium Earth Day celebration. Adams founded Catskill Mountainkeeper in 2006, and in 2014 he became the Executive Director of Water Defense, a nonprofit founded by Mark Ruffalo. In 2015, he executive produced the award winning documentary “Catskill Park” featuring Robert F. Kennedy Jr., Theodore Roosevelt IV, Debra Winger and James Prosek and he continues to work on film and tv projects that further the betterment of humankind. Dave Hnatiuk is a music for media composer/producer, music supervisor, sound engineer, and voice over artist/producer. He is a former staff music supervisor at ABC Disney as well as music director and founder of the music department at the #1 rated Fox News Channel. Now a 17 year veteran at Viacom, he performs a multitude of services including Music Supervision, voice over performance and production, original composition, and sound engineering. As one of the three current and founding members of the first ever in-house original music production entity at Viacom, Dave and his EarShock team are busy composing original music for MTV and VH1’s full slate of shows including a 2018 remake of the classic MTV MoonMan guitar theme and the original theme for Season 1 of MTV’s “Floribama Shore” and a remake of Lynryd Skynyrd’s mega-hit “Sweet Home Alabama” for the show’s second season. Dave’s music supervision work has been featured in several features and documentaries for Sony Classix, New Line Cinema, Weinstein Company among others. David Weiss is the Founder/Editor of SonicScoop, the leading online news source reporting on the NYC and LA-area music, sound and recording industries. An internationally published journalist, Weiss has been covering audio production for Audio Media and Mix magazine since 1999. His work has appeared regularly in publications such as Drum!, Time Out New York, Remix and numerous other print outlets on music and technology.